The prices for many commodities suffered the worst week in recent memory this week. Oil prices dipped below $100 per barrel, gold fell below $1,500 an ounce and silver gave back much of the past month’s gains by falling to the $35 an ounce level. The prices for other commodities such as sugar, tin, nickel, aluminum, lead and copper also pulled back. Is this the end? Has the great bull run for commodities come to an end? In our opinion, not likely. In fact, the silver trade had gotten so far ahead of itself, the iShares Silver Trust ETF was “the most highly traded security on the planet,” according to our friend Tom Lydon over at ETF Trends. This week’s selloff was less of an end to the bull market and more a function of “stampeding speculators” (to borrow a line from Sarah Turner at Marketwatch) rushing for the exits. But short-term speculators aren’t the only factor; this week’s strength in the U.S. dollar was just as much a facilitator of the price declines. The U.S. dollar found additional strength on Thursday after Jean-Claude Trichet, president of the European Central Bank (ECB), said the ECB would not raise rates until after June. By week’s end, the U.S. dollar was up 2.5 percent for the week, a pretty big move. In addition, we entered the month of May which has historically proven to be a weak and volatile period for commodities. With the Federal Reserve set to wind down its quantitative easing (QE2) program by the end of next month, it’s possible we could continue to see volatility for a little while. 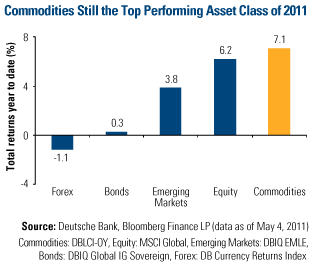 Despite the selloff, commodities were still the year’s top performing asset class as of Thursday. You can see from the chart that the year-to-date return for commodities has far outpaced the return for foreign exchange, bonds and emerging markets. Looking out on the horizon, very little has changed for the long-term bull case for commodities. The U.S. is still struggling to come up with a feasible solution to its multi-trillion dollar debt problem. Emerging markets are still seeing incremental increases in demand for nearly all commodities. And, the reserves for many commodities are still struggling to keep pace with this demand. Essentially, what happened this week was more of a “technical correction” than a fundamental shift in the long-term dynamics for commodities. The party’s not over for commodities, so don’t turn out the lights just yet. While it’s impossible to predict the future, we think in a month or two investors may look back and see this downdraft as a good buying opportunity.